The first episode of Jessica Jones feels far more like a gritty arthouse episode of SVU than a superhero show (and I mean that as a compliment). Take out one or two moments in which Jessica shows off her super strength and this would play as a straight drama with neo-noir flourishes. 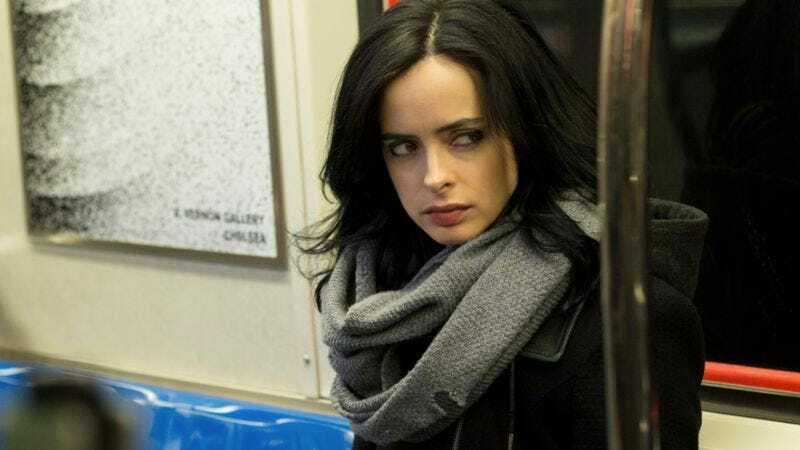 In place of the usual superhero action and banter, Jessica Jones presents a confident exploration of the psychological effects of abuse and trauma. This premiere is a visually arresting thriller with a captivating anti-hero at its center. I’d be hooked even if I weren’t contractually obligated to watch and review all 13 episodes in three days. It’s clear from the get-go that this is a show developed specifically for Netflix. A traditional TV pilot is crammed full of story in hopes of motivating an audience to stick around for a whole week. But the Jessica Jones premiere just has to get viewers to hit “play” on the next episode. Or, more accurately, to not hit “stop” before the next episode autoplays. That means the show isn’t quite as fully formed as it would be if the pilot had to carry more weight. “AKA Ladies Night” favors ambiance and aesthetic over clarity and plot mechanics. Basic facts about Jessica’s powers, her backstory, and the trauma she’s recovering from are still big unknowns. We meet the key players in Jessica’s life including her sometimes-boss, her former best friend, her potential love interest, and her drug-addled neighbor, but those relationships are pretty amorphous at the moment. That would be more of a problem if I couldn’t find out the answers with the click of the “next episode” button. And while this premiere might be just a smidge too vague for my taste, it’s nowhere near as egregious as Netflix’s Sense8, which threw its audience into the deep end with nary a lifejacket in sight. By the end of this episode I have a strong sense of who Jessica is, even if large swaths of her world are still a mystery. A lot of that comes down to Krysten Ritter’s uncanny ability to play Jessica on two levels—the jaded, sarcastic persona she presents to the world and the far more vulnerable, caring one lurking underneath. Though there aren’t literal flashbacks, we nevertheless get a sense of the woman Jessica used to be before a man named Kilgrave stole her ability to sleep through the night without first downing a thermos of whiskey. The most captivating moments are the ones where Jessica’s world suddenly floods with an eerie lavender lighting and a memory of her former captor overwhelms her mind. Though we haven’t actually met David Tennant’s Kilgrave yet, he’s nevertheless a visceral, haunting presence throughout this premiere. Unlike Marvel’s previous Netflix series, Daredevil, which set itself apart with stunning fight sequences, Jessica Jones is far more interested in the mind than the body. Kilgrave poses a mental threat that’s both metaphorical (to Jessica’s recovery) and literal (he uses his mind control powers to force Hope to murder her own parents). The episode ends with Jessica Jones deciding to dive back into her life rather than run from it. Personally, I can’t wait to join her on the journey. Marvel Cinematic Universe connections: Meet Luke Cage (Mike Colter), who’s getting his own Netflix series in 2016!